Bach to Rock in Folsom, CA is enrolling piano students for the fall season. The piano is a springboard for the study of all other instruments. On the piano, students learn to read notes simultaneously in two different clefs (treble and bass) while developing their sense of polyphony (hearing more than one sound at the same time). The piano is physically easy to play, making it possible for a student to make a good musical sound or combination of notes on the piano faster than on any other instrument. This reinforces the desire to learn. Our teachers have availability for private, semi-private and group lessons for all ages and skill levels. Don't forget about our beginner Kids n Keys class for ages 5-7, which introduces children to the fundamentals of music and piano playing in a fun group-setting. Check out our student and staff performances around Folsom and Sacramento county including upcoming dates in September and October at the Town Center Farmers Market. See our events page for more info. 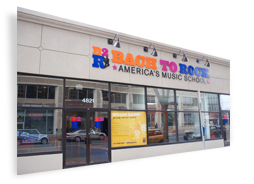 You can contact us at 916-265-2600 or folsom@bachtorock.com and we'll be happy to answer all your questions about piano and keyboard lessons as well as all other instruments we offer like guitar, drums, voice, brass, woodwinds and strings.